With wonderful encouragement from you guys, I have finally opened up an Etsy shop. My link is to the right. I'm so exited to share these cards. 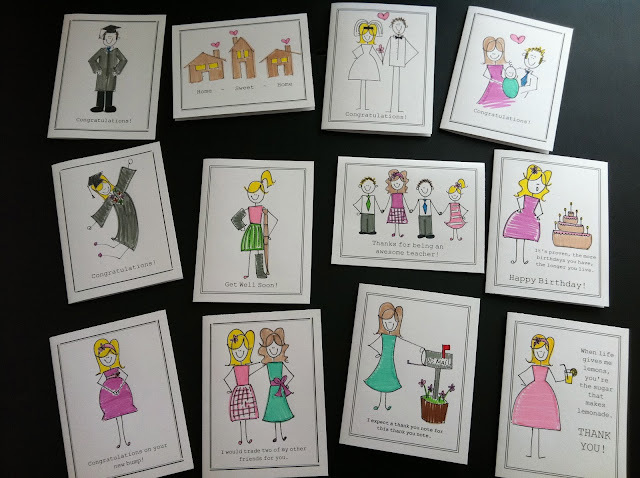 Some are new, but most are cards I have made and given to family on special occasions (so some of you might recognize these). They also come without color so you can color them how you like. Each card is blank inside with a black border, and has my logo on the back. They even come wrapped. Aww . . I already have my first customer . . . well . . it's my sister, does that count? This year my husband said enough is enough and bought us all Boise State shirts that we are required to wear on game days. So far only he and our son have faithfully worn their shirts. Our little three year old, with his limited vocabulary, will yell "Boise State" when he sees anyone with the blue and orange logo on their clothes, while this is embarrassing for me, the people in the store will proudly high-five him. So I understand this sports-theme-family-love. 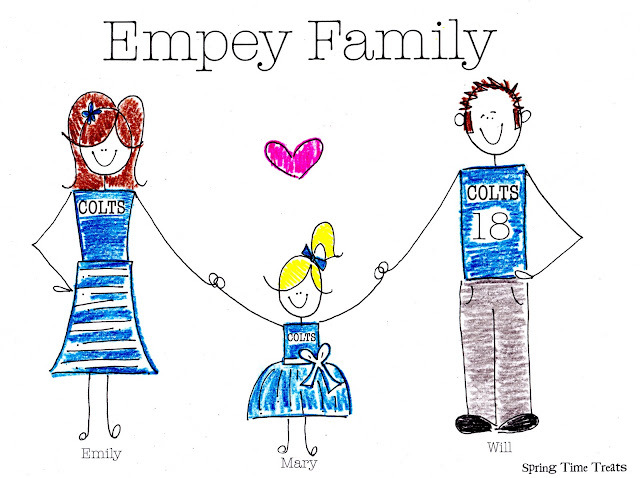 Emily and her beautiful family love the Colts. I grew up around Emily's family, and along with her they are some of the sweetest & kindest people ever. 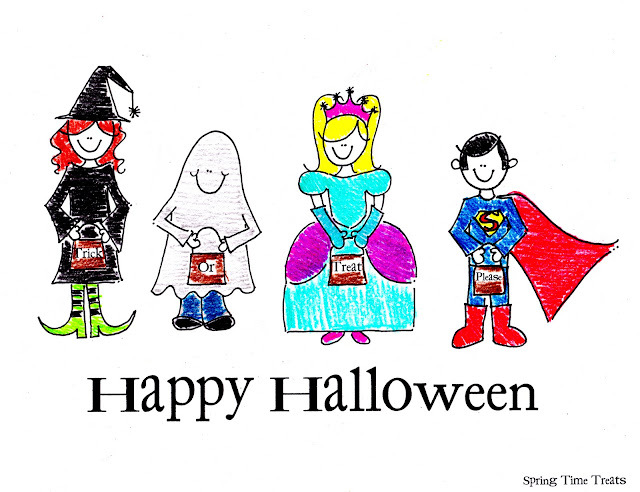 I had so many things to do last night and instead I found myself doodling children in halloween costumes. Why? Because Halloween is AWESOME! That witch is pretty stinkin awesome, huh? I'm just a little proud of myself. Our little boy is going to be Superman for Halloween this year and I spent way too long practicing that Superman symbol. I found this cute Boo Hoo at Pinterest here, and I wanted to make my own version. a sweet thank you note! Recently my sweet sister-in-law was in a car accident. A broken rib and big bruises left her feeling lucky but very sore. Her wonderful neighbors and friends came to her rescue and brought meals and cleaned her home, something that meant so much to me because we are not close enough to help. 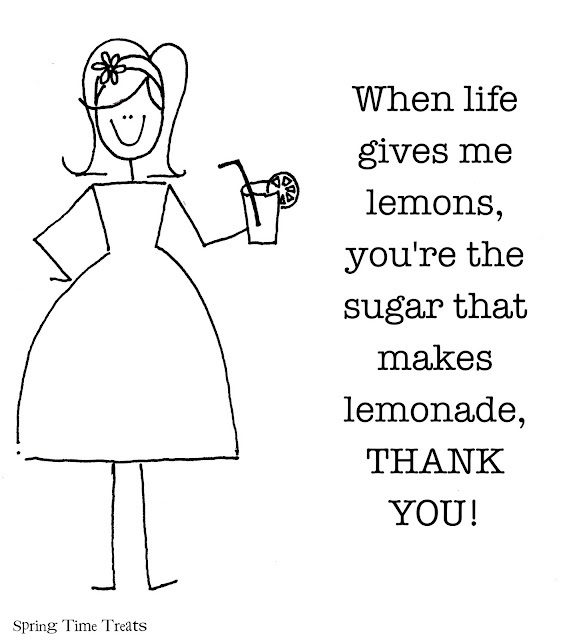 My sister-in-law asked me to draw a "thank you note" for her friends, something that had to do with her friends being the sugar that turned her lemons into lemonade. This is what I came up with. I couldn't decide which I liked more. Then my sister-in-law used her crafty skills to turn the picture into a card and delivered them to her friends with some lemon drop candies. Too cute! This is my wonderful friend Erin, who I have known since preschool. Erin is a wonderful friend. She is genuine, so very kind and always a blast to be around. She is so smart, crazy talented at sports, especially volleyball, and now she is a teacher, something I always knew she would be great at. Our little girl went to preschool last year, and that first day I looked around at all her cute little classmates wondering if she would find a life long friend there like I did. Here we are in the 1st or 2nd grade Christmas program. 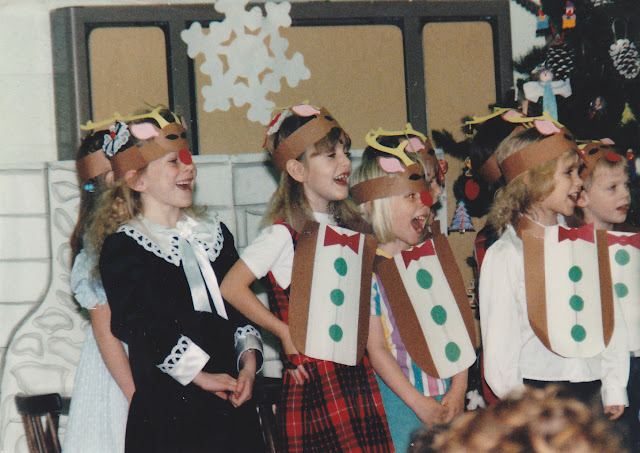 I'm the ridiculous reindeer in the red (check out that awesome crimped hair), and Erin is right next to me looking so cute in the black dress. One of our favorite memories is when I got caught cheating on our spelling test in first grade, yep. Erin and her husband Jason have the cutest baby girl, holy cow she is so beautiful, my drawings don't do justice. I experimented with fonts & colors, and title locations. I'm still working on the colors.